Wednesday. 6:30 a.m. Center City, Philadelphia. The city suddenly jolts into action from a night of slumber. There’s a lot of motion and a ton of noise. Buses, subway cars and garbage trucks create an urban soundtrack for early morning players — joggers, dog walkers, and commuters — who criss-cross city streets as they start their busy, frenzied days. It feels like business as usual, until a clear voice rings out from a downtown street corner. Good morning, Sweetie! What day is it? What day is it? Meet Tammy Mitchell. 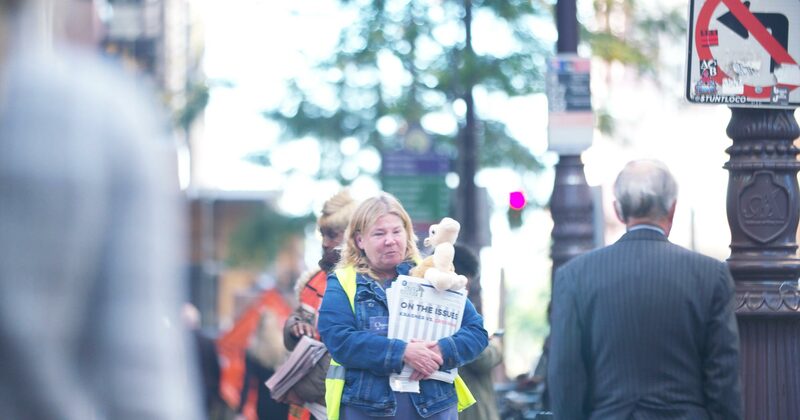 She’s carrying a stuffed camel named “Wednesday,” and she’s selling One Step Away, a newspaper created by people without homes for people with homes. Although she has some social anxiety, you’d never know it. Tammy greets everybody who crosses her path. Men and women smile, albeit reluctantly. Some stop to purchase a paper, though most keep moving on this chilly morning, their step a little lighter from the words of encouragement from an unlikely cheerleader. Two days ‘til Friday, everybody! One Step Away is Tammy’s livelihood. She purchased each paper for a quarter, and sells them for a dollar. She works to keep a roof over her head. She’s also using her natural gifts– as a writer and a person with a sense of humor — to make a difference in the world and a life for herself. Tammy’s cheerful attitude this early on a crisp morning is uncommon, but it’s even more remarkable when you find out that she lives with a physical disability — painful rheumatoid arthritis, a disorder that occurs when your immune system mistakenly attacks your own body’s tissues. Less easily detected, but more crippling, is the PTSD she wrestles with on a daily basis. 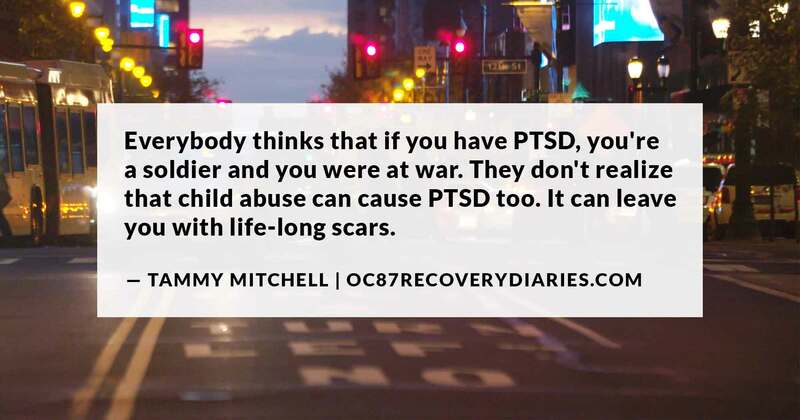 Everybody thinks that if you have PTSD, you’re a soldier and you were at war. They don’t realize that child abuse can cause PTSD too. It can leave you with life-long scars. I’m fifty-three years old. I stopped having nightmares about my childhood 10 years ago. The physical damage goes away quickly enough. The emotional damage is another story. When you’re twelve years old and you don’t even have the right to be safe in your own bedroom, when you have to fist fight a grown man in what is supposed to be your home, the people you’re supposed to be able to trust, it damages you for the whole rest of your life. You never get over it. PTSD is not any fun. It’s hell. It’s hell to not be able to sleep at night because I keep hearing footsteps in my room even though I know there’s nobody there. You know? It still makes me jump and I can’t help it. Even though I understand what’s going on, it doesn’t make it stop. Because of Tammy’s challenges, there are days when she is sick and unable to work. Not only does she have to wrestle with her demons, but she also has to confront stigma about her experience. A lot of times when you have a mental illness, it’s like you might as well have horns growing out of your head. It’s like the illness itself isn’t hard enough. You know? Living with rheumatoid arthritis and PTSD isn’t enough. I have to put up with the attitudes that other people have about such things. So, sometimes it’s just easier to just stay in. It gets really stressful. Tammy appreciates the flexibility of her job. And she makes the most of it. Tammy’s sense of humor and her interactions with her “regulars” are an uplifting force in her life. You have your good days. Wednesday morning is one of my better days because I get to check with my regulars, and having them walk by me on Wednesday morning is what’s right with the world. Does that make sense? They make the world a better place when they laugh and giggle at my childish humor. One Step Away has been a steppingstone to help her rebuild her life after she found herself without a home, living on the street, sleeping on the ground behind the high school from which she graduated many years ago. Through connections made with patrons of One Step Away, and with the aid of the money she earns selling the paper, Tammy now has her own apartment. 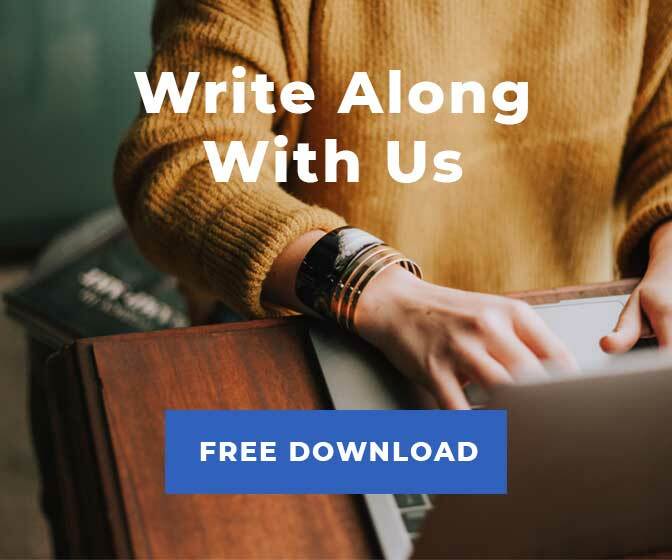 In addition to selling the paper, Tammy also writes for One Step Away, and uses the paper as a forum to discuss those ideas and issues that concern her, illuminating readers about her own journey. Her work and her home play a large role in her recovery. One Step Away gives me a chance to not feel powerless. When I wrote that article on child abuse, I felt like one person can make a big difference. A lot of my customers were coming up to me and saying, “I never knew the statistics were that bad.” Do you know that a classroom full of children die every seven days in this country from child abuse? It’s so prevalent that sometimes it seems like child sacrifice. And this is not the kind of country that’s supposed to give into that. And yet it does. After spending a few hours with Tammy, it’s clear that her job is not easy, she’s standing outside in all kinds of temperatures and faces a good deal of rejection. Still, the work gives her strength and purpose. And a resolve to make a difference in the world, in spite of (or perhaps aided by) the PTSD. There’s this book called Strong at the Broken Places, which I read. I understand what that means now. But for years, I didn’t. I just kept thinking, I’m not strong, I’m weak. The PTSD, it feels like it makes you weak and it doesn’t. If anybody out there with PTSD is watching, I want them to understand, you really are stronger than the average person. You have PTSD because you are strong enough to react to what you’ve been through, whereas most people just, they put up delusions. 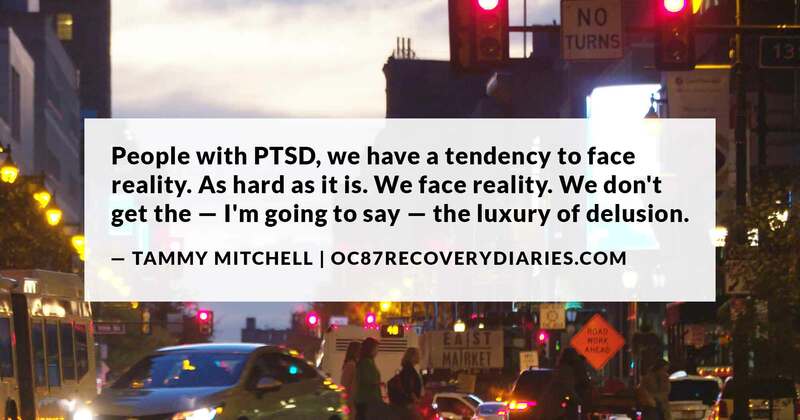 Whereas people with PTSD, we have a tendency to face reality. As hard as it is. We face reality. 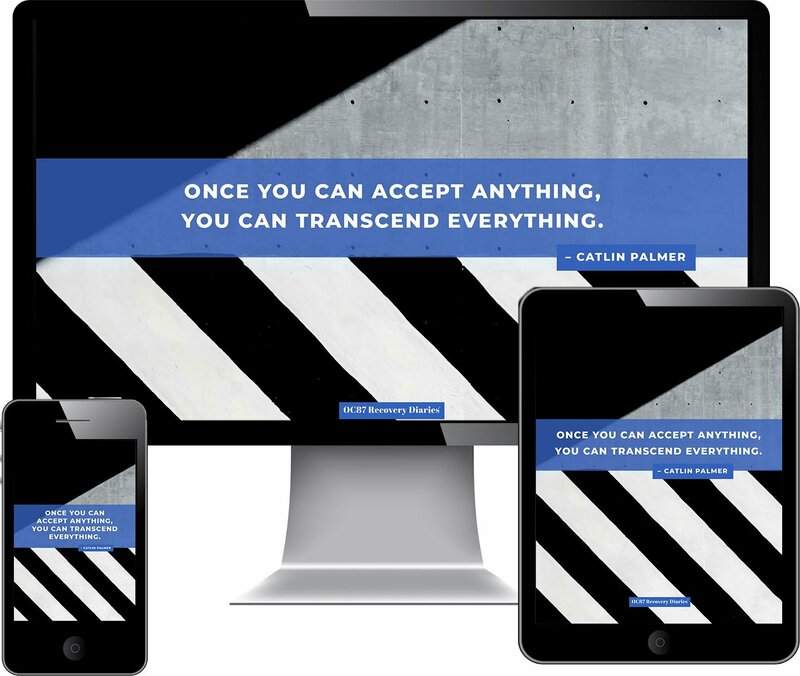 We don’t get the — I’m going to say — the luxury of delusion. I would have to say I’m someone who likes to showcase my strength. I’m stronger than I thought I was. I like joking with people. I love to laugh. I’m determined because there’s so many days when I’ve been in so much pain that I really didn’t even want to wake up the next morning, but not only did I wake up, I woke up, grabbed my papers, and came out and worked. I need to feel like there’s a purpose. That is probably the most important thing I need people to know about who I am. I need to feel like I have a purpose in life too. Anybody out there on the street, I can guarantee you that even if they are heavy in drug addiction, once that drug addiction is taken away, you will find that they need to feel like they have a purpose. I feel like we all do. 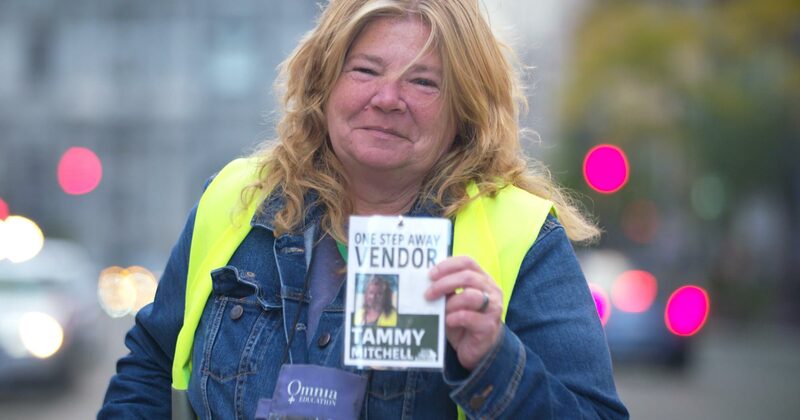 Tammy is one of about 60 people who sell One Step Away, Philadelphia’s first newspaper produced by those without homes for those with homes. 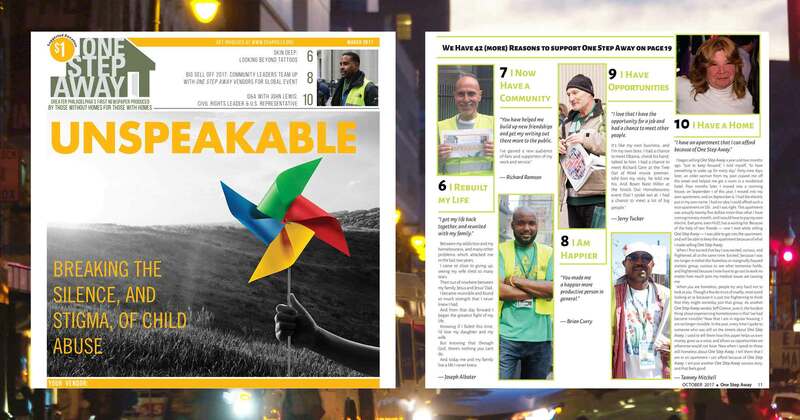 The monthly tabloid includes news about homelessness and affordable housing as well as creative writing, photographs, illustrations and other content produced by those experiencing homelessness or joblessness. Street vendors buy the newspaper for twenty-five cents, then distribute it on the street for a dollar donation, keeping the difference. One Step Away provides steady income for people experiencing homelessness (or who are at risk for experiencing homelessness), and advocates for social justice within the homelessness community. 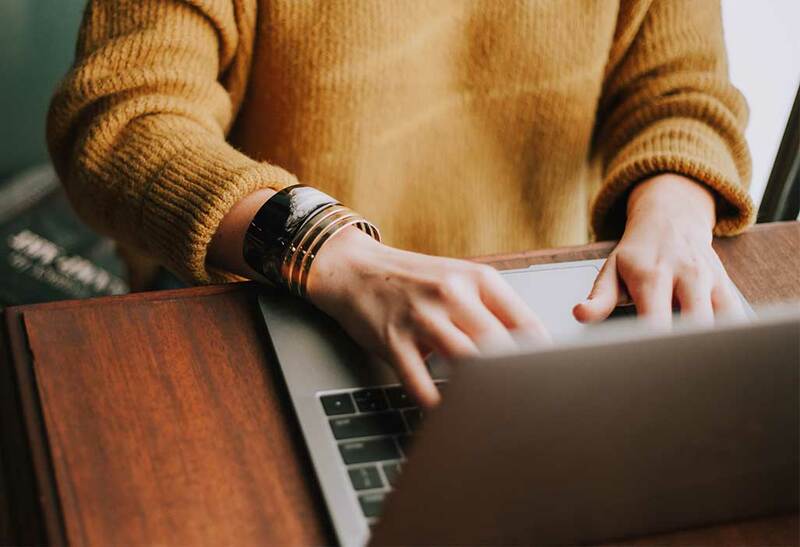 The One Step Away editorial board is comprised of men and women who are homeless or formerly homeless, as well as homelessness advocates and providers. The name One Step Away was chosen by the editorial board, reflecting the idea that each of us may be just one step away from homelessness, and each of the men and women producing this paper may be just one step away from independence and attaining permanent housing. Resources for Human Development, a national human services nonprofit with corporate headquarters in Philadelphia, publishes One Step Away each month. One Step Away is one of many street newspapers (or street papers) published in over 30 countries, most located in the United States and Western Europe. Glenn is an award-winning director who loves to create compelling documentary story experiences of all lengths for screens of all sizes. He is an avid reader, studied literature in college, and his passion for stories with strong characters and interesting narratives stems from those years. His career as a visual storyteller began at WHYY (the public television station in Philadelphia) where he worked for 15 years before becoming an independent filmmaker. In addition to his PBS documentaries about arts and culture, he has directed films about justice and human rights, and now, mental health. He was emboldened to undertake his current documentary project, Hollywood Beauty Salon, a colorful feature-length documentary about surviving mental illness and finding the courage for recovery, after his transformative experience directing OC87: The Obsessive Compulsive, Major Depression, Bipolar, Asperger’s Movie, along with Bud Clayman and Scott Johnston.